What are trap crops? Use of trap crop is a method of implementing decoy plants to lure agricultural pests, usually insects, away from the main crop. The decoy trap plants can then be treated or destroyed to eliminate the unwanted pests. Trap crop info is usually geared to large growers, but the technique can be used successfully in the home garden too. Interest in trap crop info has increased in recent years, along with the growth of interest in organic gardening and a growing concern over pesticide use, not only for its potential to harm animal life, including humans, but because spraying can destroy beneficial insects. Trap cropping is generally most useful in larger plantings, but can be scaled down depending on the crop and trap used. In order to learn how to use trap cops successfully, think in terms of a specific pest and learn its preferences for food sources. There are two basic ways for how to use trap crops. Same species – The first is to plant several decoy trap plants of the same species as the main crop. These decoys are planted earlier than the main crop and serve as food for the insects. After the pests have arrived, but before they’ve had a chance to attack the “real” crop, the decoys are treated with pesticide or are destroyed. This works particularly well with larger plantings, and using decoy plants around the perimeter helps since pests generally work from the outside in. Blue hubbard squash is an excellent trap crop for attracting and retaining cucumber beetles, squash vine borers and squash bugs. Different species – The second method of how to use trap crops is to plant a completely different and more attractive species of decoy trap plants. For example, sunflowers are extremely attractive to stink beetles and leaf-footed bugs, but must be planted early so they bloom in time to intercept the bug’s migration. Once the destructive insects have arrived, the gardener can use his preferred method of elimination. Some gardeners choose to use pesticides only on the decoy trap plants, thus reducing the amount of pesticide used, or to destroy the infected plants completely. Other gardeners prefer the more organic methods of netting, vacuuming or hand picking to remove the unwanted insects. Will using decoy plants completely eliminate your insect pest problem? 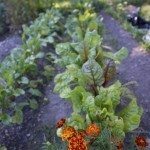 Probably not, but if reducing the amount of pesticides you use in your garden or increasing yields without pesticides is your goal, learning how to use trap crops may bring you a little closer to your ideal garden. TomatoesMulching Tomato Plants: What’s The Best Mulch For Tomatoes?